On April 20, 2014 a wayward spark, possibly from a passing train, started a wildland fire that had the potential to threaten the town of Ogden Dunes, Indiana. As a result of a preventive prescribed fire conducted by the fire management staff of Indiana Dunes National Lakeshore in fall 2013, the fire did not become large and devastating. The Tolleston Dunes prescribed fire unit #9 sits directly to the west of the town of Ogden Dunes, Indiana. Bordering US 12 and a very busy commercial railroad corridor, the burn unit consists of 30 acres of mostly oak savannah fuel type. Directly north of the unit is Long Lake, part of the national lakeshore’s West Beach recreation area. This lake and the rail lines to the south make the Tolleston Dunes unit #9 unit a long and narrow piece of land, perfectly aligned with the southwest winds that typically cause large wildfires in northwest Indiana. 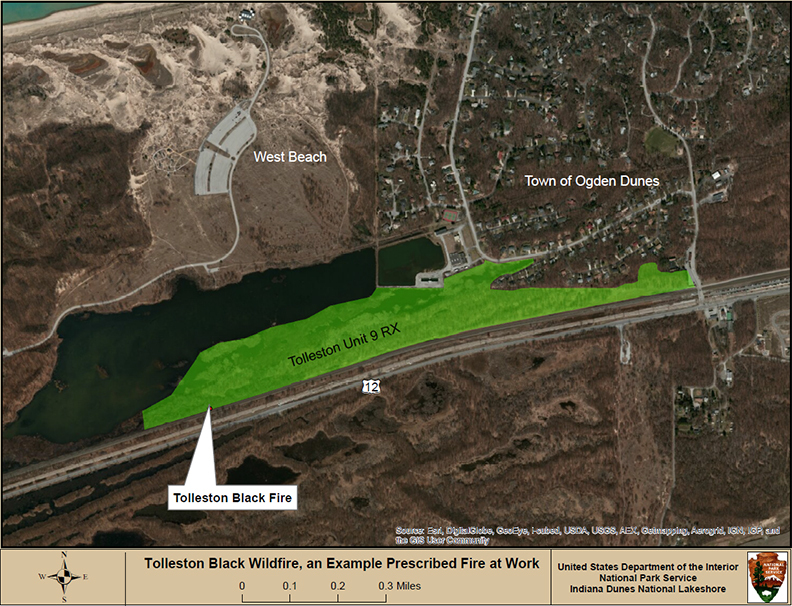 The Tolleston Black wildfire was limited in size and intensity due to a previous prescribed burn. View a map of the prescribed fire treatment area and wildfire. Since 1999, fire staff from Indiana Dunes National Lakeshore have burned the Tolleston Dunes unit #9 five different times both to reduce the amount of hazardous fuels in the area and to improve wildlife habitat. The last prescribed fire on this unit occurred in November 2013 and was accomplished in conjunction with the Ogden Dunes Volunteer Fire Department. This collaboration allowed an additional 18 acres of town-owned land to be burned. When that wayward spark landed in receptive leaf litter along the railroad tracks in April, it burned only a 15-foot-square patch of downed leaves and small sticks. Thanks to a very successful prescribed fire last fall, and burns over the last 15 years, the town of Ogden Dunes was spared from an unwanted wildfire.